I finally got caught up on stuff enough to make a post about our trip to Canada. 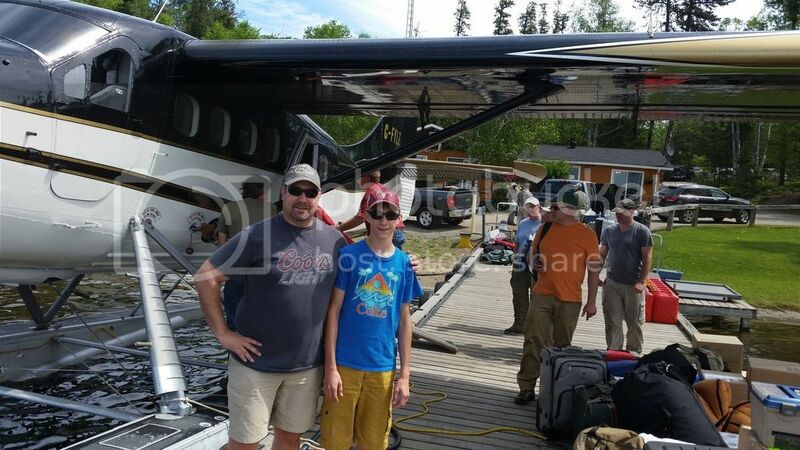 Once again it was a great trip, and even more fun getting to share it with my 13 year old, Michael. When we weren't in the boat, he was found fishing off the dock. 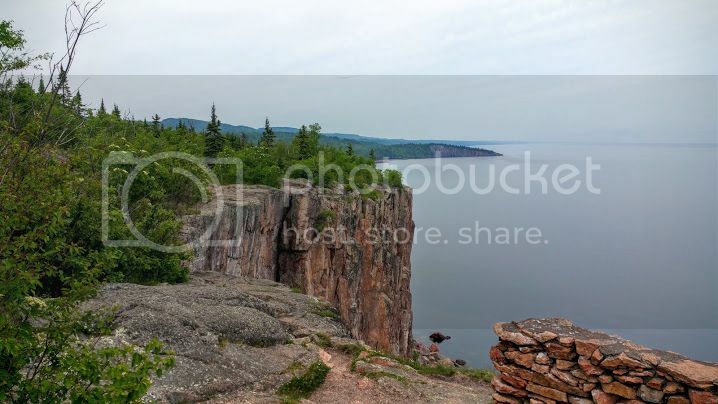 Anytime we bring someone new along, we always stop at Palisade Head, just north of Silver Bay, MN. It offers a nice view and a bunch of bushes and trees to relieve the soda you drank at lunch in Superior. After spending the night in Thunder Bay, it was time to fly out. 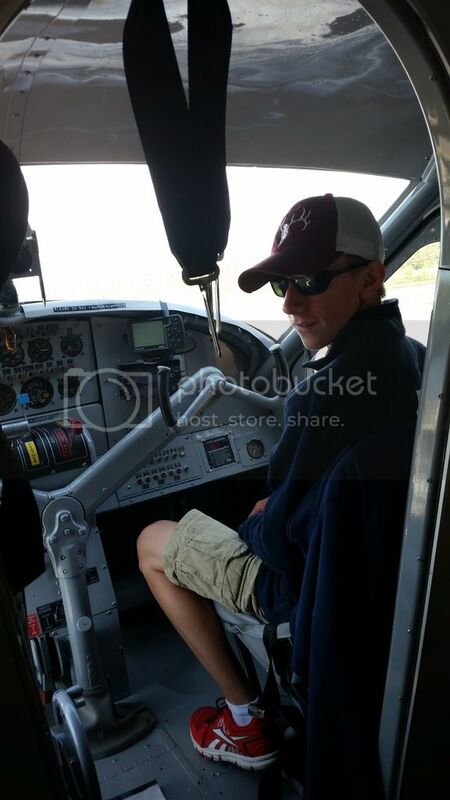 Since the rest of us had flown shotgun at one point or another, we had Michael sit up front in the Otter. He thought it was pretty cool. After getting unloaded and rigged, we were off to fish. Started by marking the one reef in the lake, to avoid having someone bust a lower unit. 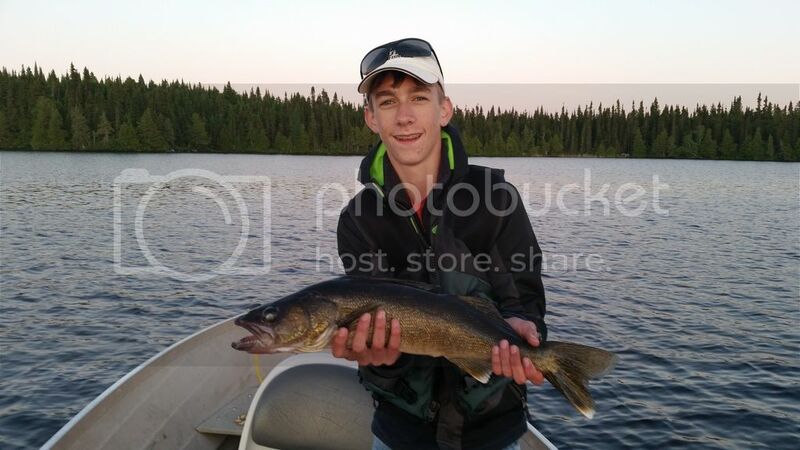 We fished off the edge and caught walleye 1 after the other for about an hour. Then it was off to do more scouting, which seemed crazy to Michael. 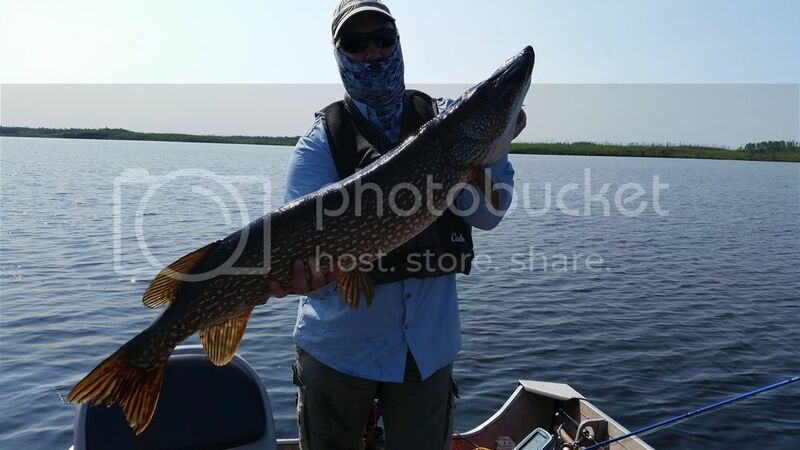 I assured him there would be many more walleye caught, and we really needed to see where the weed growth was, etc., so we could pattern the pike. The weeds were coming up nicely, and we hit a proven spot after supper, more on that shortly. On our last stop before supper we caught some walleye for eating. It was off an island point and we were slamming them. 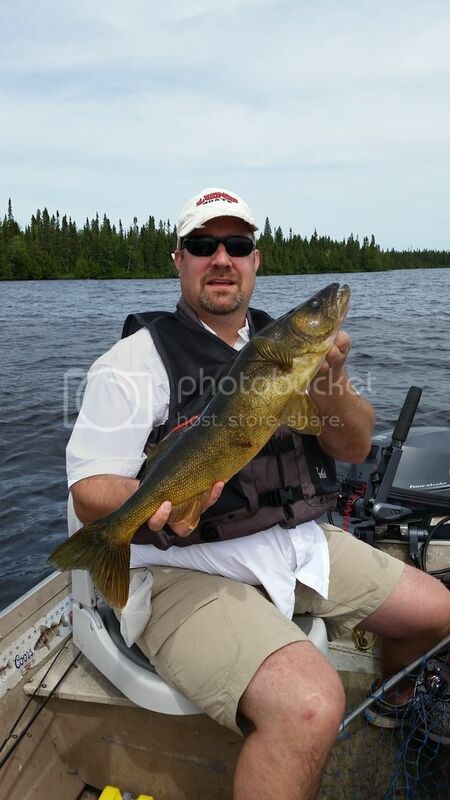 I had a hit and wow, I thought I had a giant walleye on. 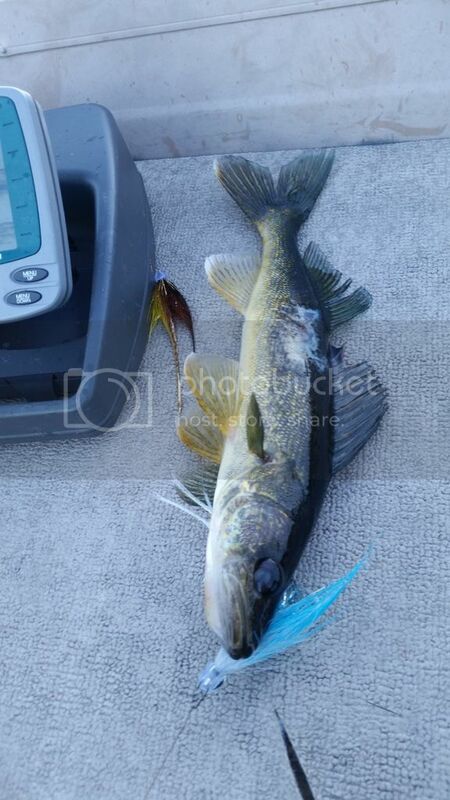 Turned out it was an upper 30's pike that ate the small walleye I had hooked. We had it boatside and it rolled off the rim of the net on Michael. He was pretty mad at himself, but I told him not to worry, as there would be more big ones. Below is one of the better fish at our 1st stop. 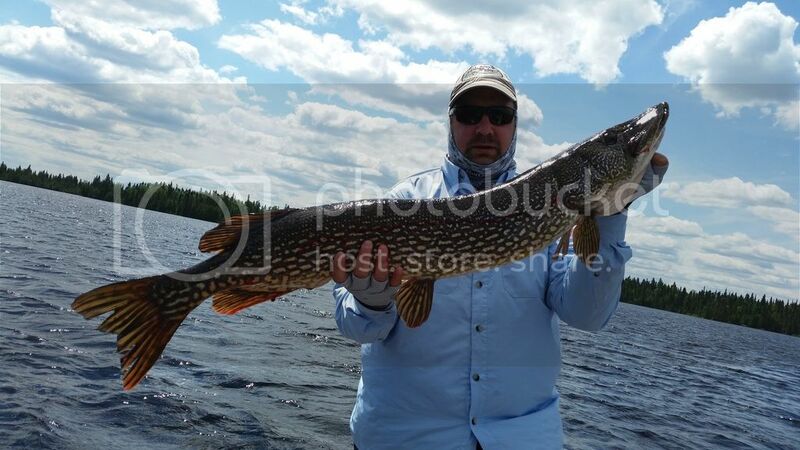 I have personally caught about 6 or so pike right at the 40" mark, many in the upper 30's. That night Michael broke my mark by catching this 41" on a boat side strike. He was shaking for about 10 minutes after that, since he had never caught any over 30" prior. I like the fact that he doesn't feel the need to wear a glove to handle the fish, even at 13 years old. 2 pix of the beast below. The next day was warm, windy, and threatening storms. 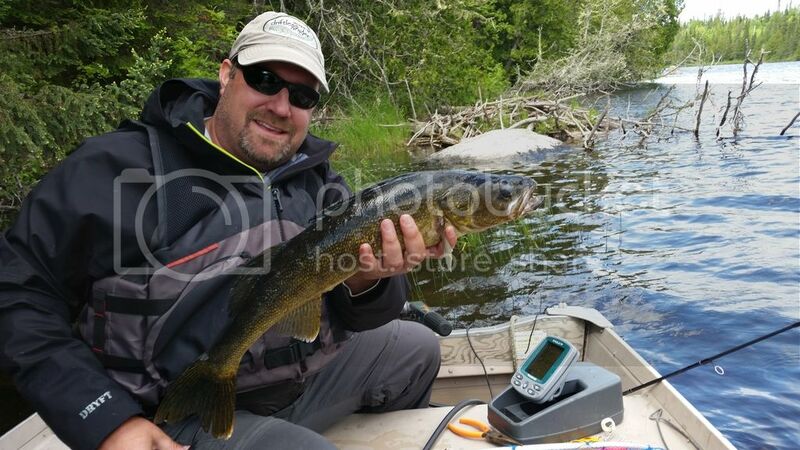 More scouting, walleye fishing, and catching lots of pike and eyes. The major storms just glanced us, but apparently brought hail, etc just to the south. The day after that was classic cold front, windy and mixed sun and rain. It ended up raining about 10 times, with a couple of squalls that produced upwards of 50 mph gusts on the leading edge. We luckily had gotten out of the main lake just as one hit. It was pretty scary stuff. It was a bit slower based on the condition. The next day the weather cleared up a bit finally, and we were back on the fish. Mid-afternoon I got the 43" pike below, finally cracked the 40 inch mark! Appeared to be a skinny female, still recovering from the spawn. The blood is from my finger, she slashed me when unhooking her, luckily it wasn't too deep. We got her in the same weedbed that Michael got his 41" the 1st night. 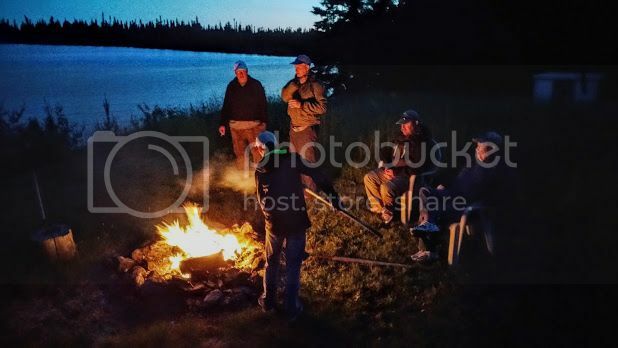 Later that night we had a great sunset, fire, and cool moonrise over the lake. Many nice walleye were caught, and it became a blur as to when. Below are a couple more eye pix, including a smaller one caught on the fly that had apparently evaded an attack from a big pike. On the last day I decided since I had caught my biggest pike to date, I was going to fish exclusively with the fly rod. If you are looking for a good setup, I highly recommend the Sage Motive 9wt paired with the Rio Pike/Musky fly line. It it a great pairing. I fished the sink tip all day, and once I had the double haul figured out, was shooting 80-90 feet of line. This coming from an average at best caster. Anyway, I found a map that someone previous had left at the cabin. 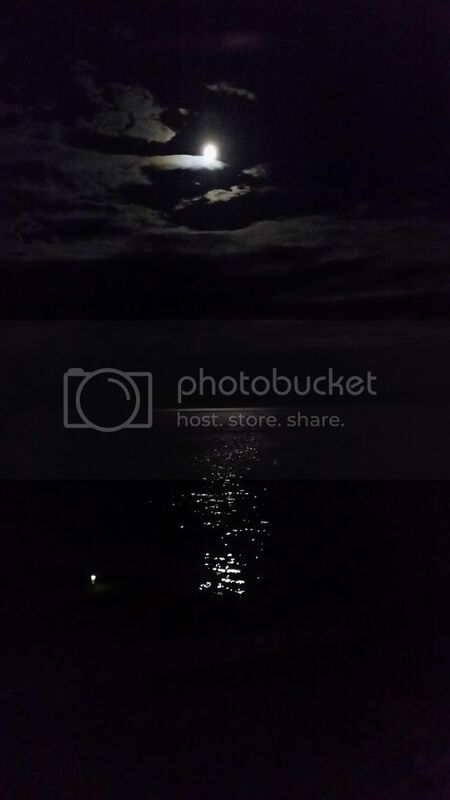 It showed a "feeding shelf" right off an island. Of courese I had to scout it, and it was a manificent new spot to fish. Small Island with about a 100 yard rock reef sticking out, deep on one side, shallower with weeds on the other. We had stopped at one spot on the way there and gotten a few smalls, but all hell broke loose on my 1st cast at the feeder shelf. After about 2 stips I had a hit, and it was big. It immediately ran and took me into my backing. After a few more runs and about a 10 minute fight, this healthy 41.5 incher was in the net. We did well all day, even with the bright sunny conditions. Shortly after lunch, I hooked an upper 30's pike, but lost it when it got tangled around a marker buoy rope at the main lake reef. When things got flat, we even saw pike follow our baits, only to ignore them. Something they must've learned from their esox cousin, esox masquinongy. Many of these follows were mid to upper 30's pike, that were apparently not actively feeding. About 6 such cases happened when we went back to the feeder shelf and fished the deep side of the reef. It was getting late in the day and I told Michael this would be our last stop. 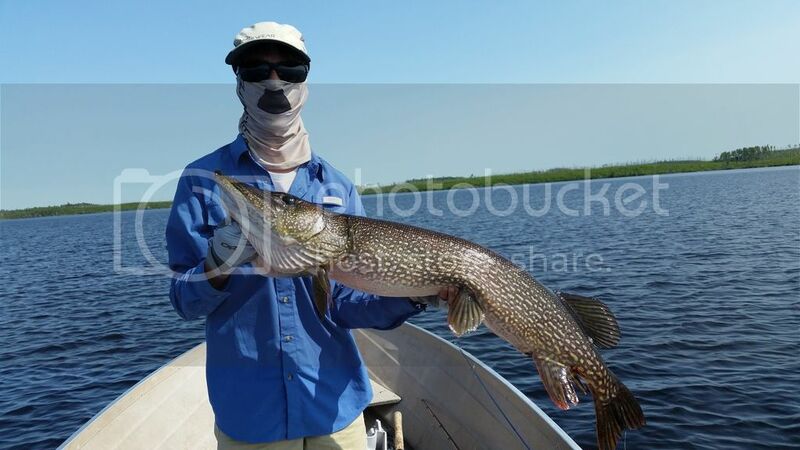 He stated he hoped he would catch at least 1 more big pike. I told him he was already spoiled breaking the 40" mark on the 1st night. Well when we got around to the weedy shelf, he got his wish, in around the same spot I had scored earlier in the am. 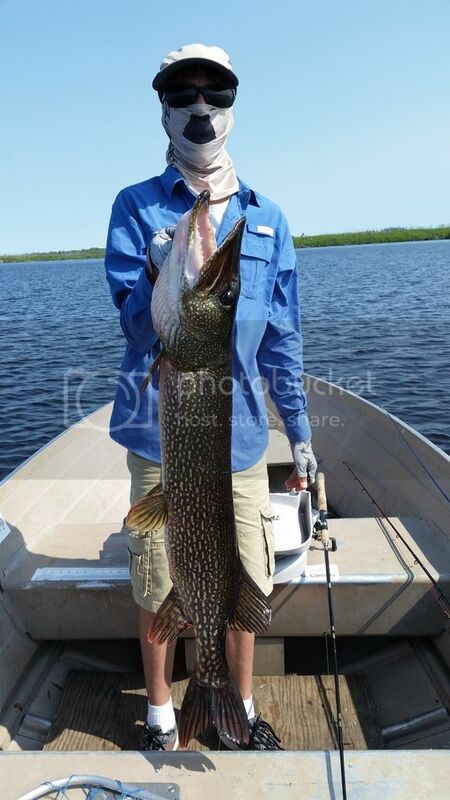 After a long tussle, this 42" with a gigantic head was posing for pix. Even with a couple bad days of weather, it turned out to be a great trip. 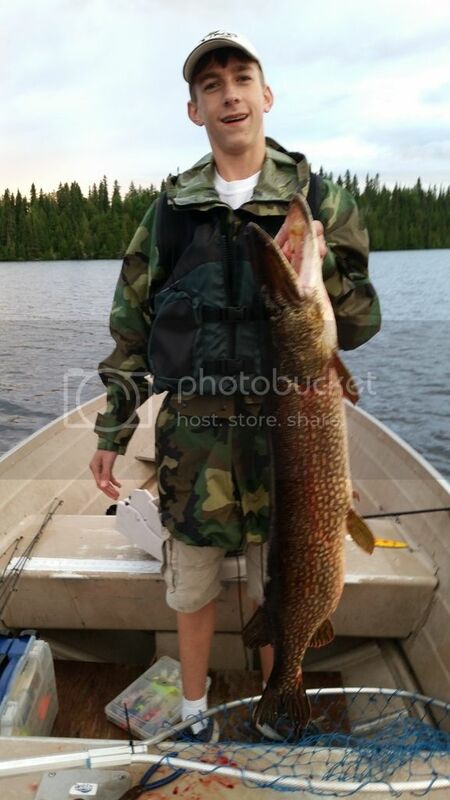 We scored 4 pike over 40" between Michael and I, and many, many walleye. No trophy walleye, but quite a few in the 24-26" range. My only regret is not fishing the flyrod more, earlier in the week. I fished it here and there, but once I fished it all day, I really got the feel of the double haul cast. I will definitely remedy that next time around. Michael is already looking forward to going back, hopefully we will be able to do this every other year! That looks like quite the adventure! Cool looking Pike too. Has to be a blast to feel that weight with a fly rod. 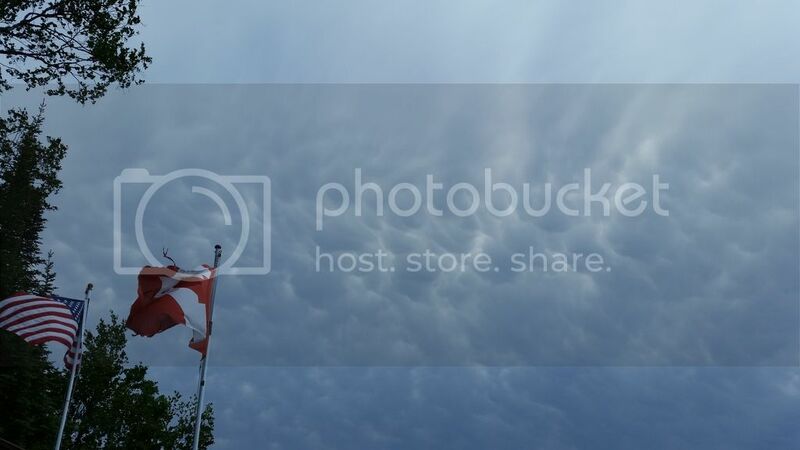 The photo of those Mammatus clouds reminds me of a trip to Canada I did back in the 70s while still in high school. 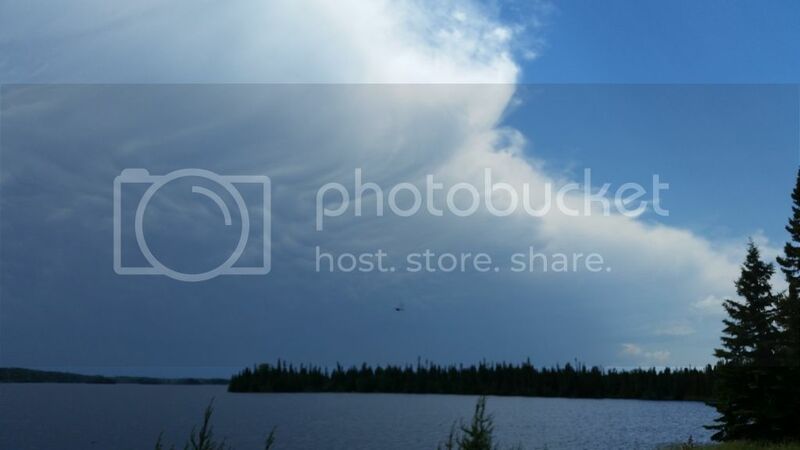 While we were fishing one day a storm clouds rolled in, along with those Mammatus clouds. I recognized those from my flight training as a warning sign of approaching bad weather. The storm did a lot of damage, our boat swamped and I thought we were a goner. We were young and stupid and got over it quickly, but I remember the adults in the group were still shaking days later. Glad to see you are teaching your son to fish too! I bet after that trip, it's all he wants to do. Some might fine fishies you caught! That's for the report and the pics. 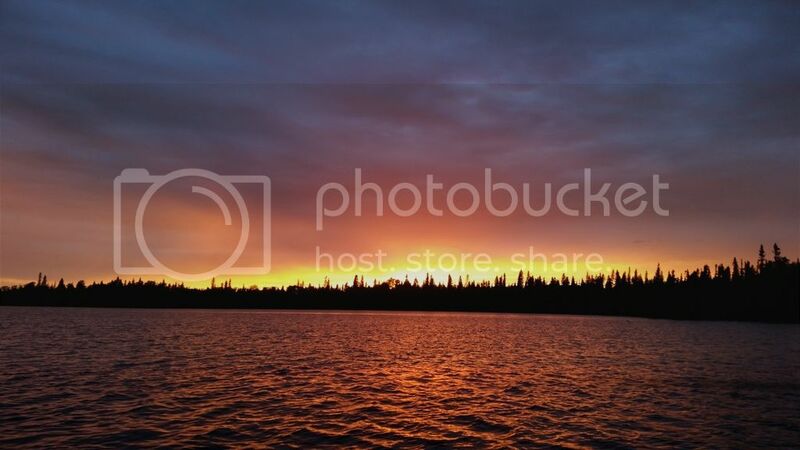 I'll be up at Lac Seul in a few weeks, hopefully we'll continue to do well up there. 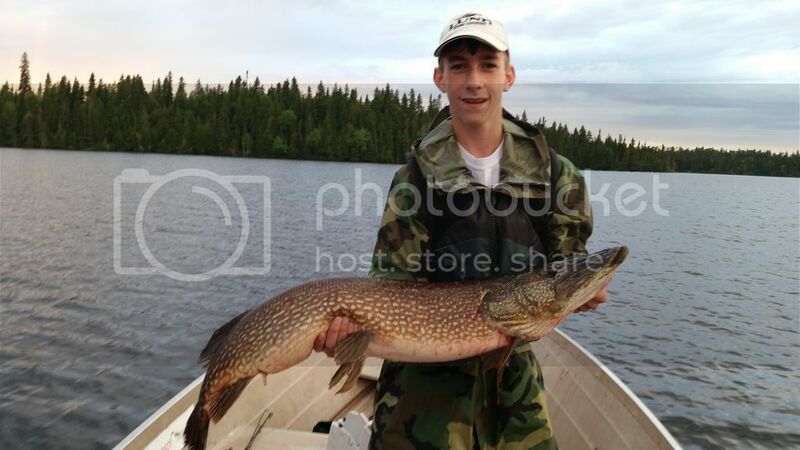 Nice job on the Pike!